Edward John "Ed" Markey (born July 11, 1946) is an American politician. He is the United States senator of Massachusetts serving since July 2013. 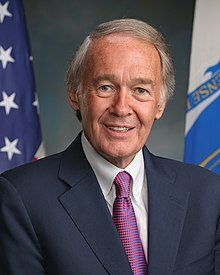 Before serving as senator, Markey was member of the United States House of Representatives for Massachusetts. He is a member of the Democratic Party. ↑ "Markey, Edward John". Biographical Directory of the United States Congress. United States Congress. This page was last changed on 29 June 2018, at 06:43.